Don’t want to spend hours outlining, flooding, and decorating cookies with royal icing to get a pretty decorated effect? You need my easy cutout cookies! It’s so simple to colour a portion of the dough with gel food colouring and then play jigsaw with a Christmas tree cutter. These cookies are a great testament to what the mind can dream up when it’s not otherwise occupied. I had the idea for them (as well as some forthcoming cupcakes!) while at a boring just not my kind of music gig with Lee. I was thinking about new and exciting christmas baking ideas that are things I haven’t done before. In fairness, Lee won my heart during an indie/alternative (now admitted) phase, and then moved onto liking some much more shouty music, while I still like indie/alternative/folk and a bit of pop! Simple vanilla sugar cookies are ideal for so many situations! They’re delicious with a cup of tea and hold their shape really well with lots of room for sprinkles and frosting. In the past I’ve played around with royal icing (lovely Bridget at Bake at 350 makes the most incredible iced cookies!) to decorate cookies, which looks stunning, but is quite time consuming. It’s right for a really special occasion, but not for everyday biscuits in my book. 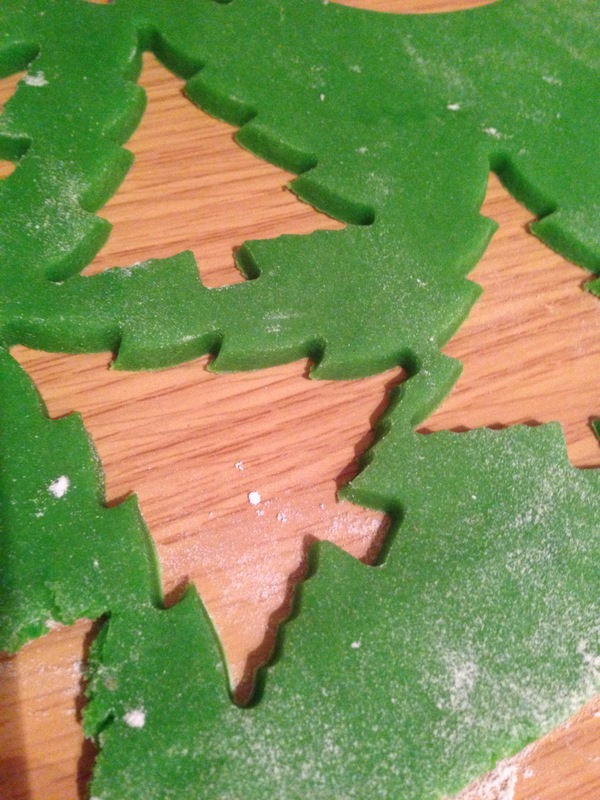 For these Christmas Tree Cookies, half of the cookie dough is easily coloured forest green by adding about a third of a teaspoon of green gel food colouring(it’s the same stuff I use to make my Rainbow Cake!). I often get mine from eBay for a couple of pounds, or you can try your local cake decorating shop.You can wear clean rubber gloves if you’re worried about your hand getting a bit green, and just gently knead the colouring into the dough. It will go tie-dye at first, but keep kneading until the colour is completely even and the dough is a forest green colour. Your Christmas tree cookies would be absolutely gorgeous plain, but I made mine even more festive with a few sprinkles and some edible glitter.